In 2001, I accompanied a couple of friends on a weeklong trip to the UK. Most of our time was spent in London but, about four days in, we took a short flight to Edinburgh, Scotland, I'd never been there before-I haven't been much of anywhere-, but I'm always willing to try something new. Here, I'm glad I did. We only stayed a couple of days so we didn't get to do everything we wanted, but here are a few suggestions. -Visit one of the many castles. There are seven different castles in the Edinburgh area, each with its own unique history. We only got to go to Edinburgh Castle, but that was more than enough because this castle is where a lot of the Scottish kings and queens lived. We got to see the Stone of Destiny (http://www.visitscotland.com/about/arts-culture/uniquely-scottish/stone-destiny), where many Scottish kings and queens were crowned. I strongly suggest following one of the itineraries or guided tours to make the most of your time. -Exploration! Like a lot of historic towns, Edinburgh is very 'compact'-there is a lot to do and see in a relatively small amount of space. There are guided bus tours, but you can still get a lot out of exploring the city on your own. You can drive, but half the fun is walking around and visiting the little shops and cafes. Since they don't have the 'urban sprawl' problems we see here, there is still plenty of room in the area for open spaces. 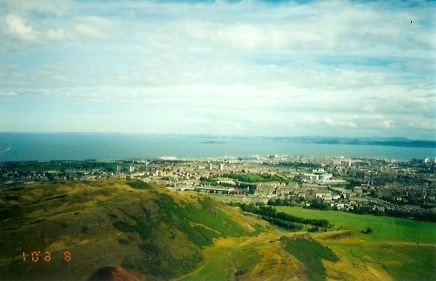 The picture above was taken from the top of Arthur's Seat, a hill (mountain?) that even the least 'fit' of us can conquer. There are 'easier' trails to the top for people who don't want to climb, but we went straight up to the top, As you can see, the view from the top is awesome! The fact that I had to wear a sweater in August was a very welcome change from the 90°F + days here. -Street Festivals! We arrived at the beginning of the annual Festival Fringe, the largest arts festival in the world. It takes place in August of each year and features goods and performances from groups all over the world. We got to hear an a cappella group from Togo (west Africa), watch acrobatics involving a unicycle from a man from Japan and listen to some good-natured heckling from an Australian. I just wish we'd gotten to stay longer because this is the sort of thing I don't get to experience very often outside Atlanta. -Find Your Tartan! According to my aunt (a genealogist by hobby), my family name can be traced back to Scotland. It didn't surprise me since we seem to have a little bit of everything in our line, but it got me interested in finding our tartan. The Royal Mile was definitely one of the best places I could have gone for that because there were quite a few authentic souvenir shops. Scots Connection (http://www.scotsconnection.com/default.asp?) and Tartans of Scotland (http://www.tartans.scotland.net/tartan_info.cfm@tartan_id=1189.htm). The one shown here is (one of) ours. Like I said before, I couldn't possibly do Edinburgh justice in this one article. Check out http://www.edinburgh.org/ to plan your vacation!